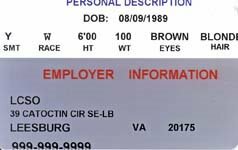 Solicitors from local businesses are required to be registered through the Loudoun County’s Sherriff’s Office and are required to carry a business ID (sample ID below). To receive this formal ID, a complete background check is given and solicitors are legally bided to abide by a code of conduct set forth by the Sheriff’s Office and are listed on the county website . If you encounter a violation of these codes, please call Loudoun County’s non-emergency number immediately at 703-777-1021 or 703-777-0445.